The corridors of power will never be the same again. The Rt. Ho. James Hacker PC, MP, BSc (Econ) has made the ultimate political journey: to No. 10. And his newly appointed Cabinet Secretary Sir Humphrey Appleby is on hand to advise, encourage, and look after No. 1. Now this legendary partnership can steer a course through the twists, turns, and minefields of bureaucracy and government in four classic episodes from the highly successful BBC television series. The four episodes include "The Smoke Screen", "The Ministerial Broadcast", "Official Secrets", and "A Conflict of Interest", in which Jim Hacker has reached No. 10, and Sir Humphrey Appleby puts a spanner in the mechanisms of government. Perhaps the finest political comedy ever broadcast, the most tangled of plots and lines are unwound with seeming effortless grace by the writers and actors. Top notch stuff that was admired by Margaret Thatcher, the real occupant of number 10 when it was run, a must listen for anyone interested in literate comedy. Classic British Humour at its best. I am assuming no one has written a review before because it really isn't necessary. Anyone thinking of buying this audio cd knows exactly what they are getting! Anyway, for the record :-As a fan of the original BBC TV series, I loved hearing it again,(and again and again)and although I bought it to keep me amused whilst doing various 'chores', in the end I had to stop the chores and just sit and listen, because it is just so damn funny. 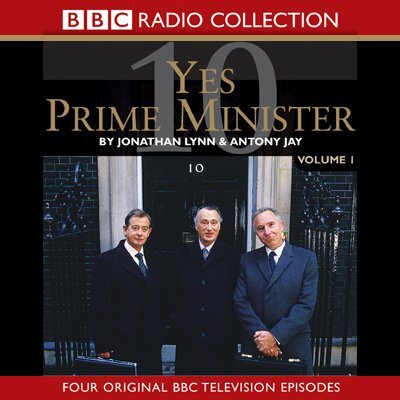 The images of Bernard, the Prime Minister and Sir Humphrey so clear as I listen to their banter. Both British and Classic, Humour it certainly is, and comes across almost as good on audio as watching the original version on TV. Marvellous stuff, but you knew that already ! I have never seen the TV series and was not sure if I could enjoy this. I was wrong and I'm glad of it. I created the characters and scenery for myself as I cooked, cleaned and worked around the house. I love this and look forward to the other volumes, spring cleaning is fast approaching.